We are shaking off the winter doldrums here in the Alamo City, and it seems like the real estate market is following suit. Buyers continued to find properties to call home in February, with a three percent year-over-year increase in sales for a total of 2,012 homes sold, according to the Multiple Listing Service Report from the San Antonio Board of REALTORS® (SABOR). Meanwhile, the average and median sales prices each climbed six percent from last year, with a median sales price of $215,100 and an average of $247,300. 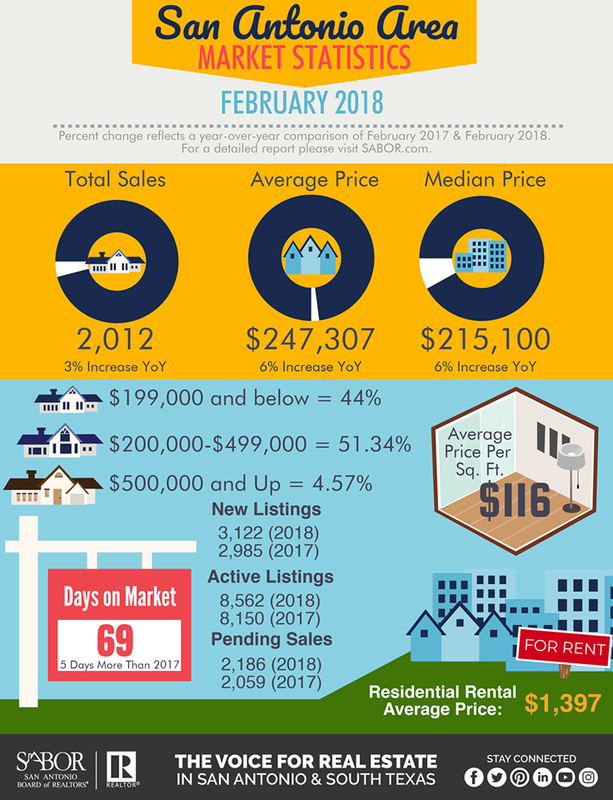 “With tight supply and high demand for homes, 97.6 percent of sellers in February were able to sell their homes for list price,” said Lorena Peña, SABOR’s 2018 Chairman of the Board. “But even though the market is favorable to sellers right now with just 3.3 months of inventory available, we still continue to see a steady flow of houses come on the market which is good news for buyers. Here on the Northside, I’ve seen a similar increase in inventory in March. My phone has been ringing with people looking to list their homes, especially in perpetually hot Inwood. Luckily, San Antonio’s economic forecast continues to be strong, meaning plenty of buyers for those homes. “With people continually moving into the city for jobs, including our military and medical personnel, there is always a market for both buyers and sellers at many different price points,” according to Gilbert Gonzalez, SABOR’s Interim CEO.